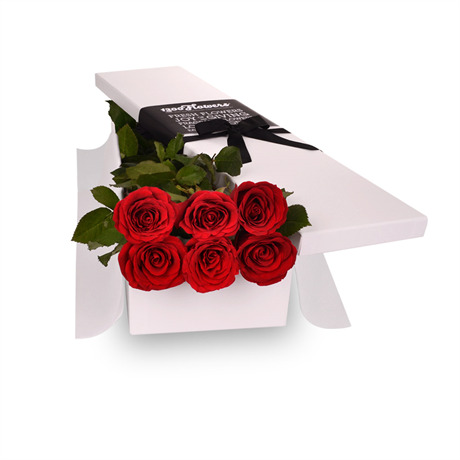 Lavish love and adoration on someone special with the Mischa- an opulent gift box which, once opened, reveals six exquisite long-stemmed ruby red roses. The ultimate in romance, this gift showcases the sublime beauty of roses and will be received with happiness and appreciation. This gift is perfect for an important anniversary, a special dinner, Valentine’s Day, a surprise for your loved one at work, or a spontaneous display of affection. We’re happy to help you make someone feel extremely special, and each of our roses is checked for flaws to make sure you are receiving only the best- down to the very last petal. To go all out, we suggest pairing this exceptional gift with some sparkling champagne, some delicious chocolates, and a keepsake vase to arrange the flowers into. They’ll love your effort and will be overcome by your thoughtfulness.